Welcome to the first week of February and the first week of blogging for me in the new year. 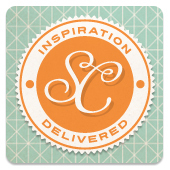 This week we are going to inspire you to use a little gold and glitter in your scrapbooking projects. I for one didn´t ever think I would like gold, I´m a strickly silver kind of gal when it comes to my own bling. But then I got a Pocket Letter from a friend with lots of gold on it and I suddenly fell for the gold trend in scrapbooking products. I am not one for going overboard though, so for my layouts I use gold accents like chipboard hearts and such. For the layout I am sharing today I used washi for my gold accents. In December I bought a pack of gold washi to use in my December minibook and I really like the pattern and subtle pop the gold gives. You could say I used them as my patterned paper on my layout. I simply taped the corners in strips. But boy is shiny things on scrapbook pages hard to photograph! I hope the glare isn´t to hard on your eyes. On the other hand, in my non-scrapbooking paper crafts I like to go all in :) This is a Pocker Letter to the same friend that send me the gold one. I thought I´d return the favor since she loves pink and gold! I used the same gold washi tape set here too. I started by just covering a plain paper in the washi and then cut out the cards for the pockets. What about you, do you love and use the gold trend in scrapbooking products?